A group of nine college students staying at a friend's remote island mansion begin to fall victim to an unseen murderer over the April Fool's day weekend. As many of you may know I'm a huge fan of 80's Horror, which brings me to this feature. During the 80's there was a run of titles based around commemorative days such as "Prom Night", "Graduation Day", "My Bloody Valentine", "Friday the 13th" and more so this title was inevitable The question was how would it play out? Director Fred Walton had already released the great "When A Stranger Calls" so we already knew he had the talent to entertain Horror fans and create a suspenseful atmosphere, which me manages to do again here. One thing that's obvious as you watch the film is how well constructed the flick actually is which is rarer than you think, especially for a film in this genre in the 80's. It makes for refreshing viewing and tries to steer clear of the cliches. Now the films ending will divide opinion, I won't spoil it for those of you who haven't seen it but personally I think it's fantastic and fits the film perfectly. "April Fool’s Day" is an under-rated 80's gem and most definitely worth your time. One of two mid-1980s murder-about-the-house comedies made by the Paramount Pictures studio. The other picture was the board-game spoof Clue (1985). The film's French title was Weekend of Terror, while in Germany release was titled The Horror Party. The movie's story-line has often been likened to Agatha Christie's "Ten Little Indians" (aka "And Then There Were None"). The name of the literary work that Muffy St. John ( Deborah Foreman) quoted from was James Boswell's "Life of Samuel Johnson" (1791). The picture was entirely shot in Canada's British Columbia with predominantly American actors. Debut produced screenplay of writer Danilo Bach. The movie's producer Frank Mancuso Jr. had acted in various producing capacities on four "Friday the 13th" pictures of whose film studio on them was the same Paramount Pictures for this film. Actress Deborah Foreman utilized "Sheryl Lee-like features and facial expressions" according to Allmovie. 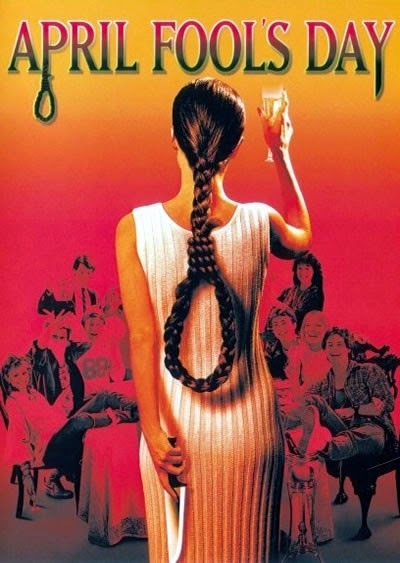 A hangman's rope noose was formed out of the letter "P" and a dagger out the letter "Y" in the film's original 'April Fool's Day" promo title logos. Moreover, a hangman's rope noose was formed out of pony-tails hair of the poster's central female figure (meant to be 'Deborah Foreman') who also held a dagger behind her back. The literary classic that one of the college friends was seen reading was John Milton's "Paradise Lost" (1667). Another horror movie utilized the same title around twenty-two years later with 2008's April Fool's Day (2008). This unrelated picture was not a remake but was also a slasher movie and unlike this 1986 film which underplayed the gore off-screen, the 2008 film was more in the tradition of the usual gory slasher pic that this film evoked and spoofed. A novelization of this film written by Jeff Rovin was first published in 1986.